We conducted the funeral for Louis Tustão in the interior village of Neves; that left his wife Dona Olinda no longer able to hold together her family of five children. They were scattered mostly to be taken care of by some of their relatives. But it was of concern to the oldest boy, Louis Roberto da Silva that his sister, Marlene, was to live with an uncle who was an ardent Spiritist. He did not want her involved in the séances so contacted us wondering if we might take her in to our home. Marlene may be the little one in the arms of Dona Olinda on he left. 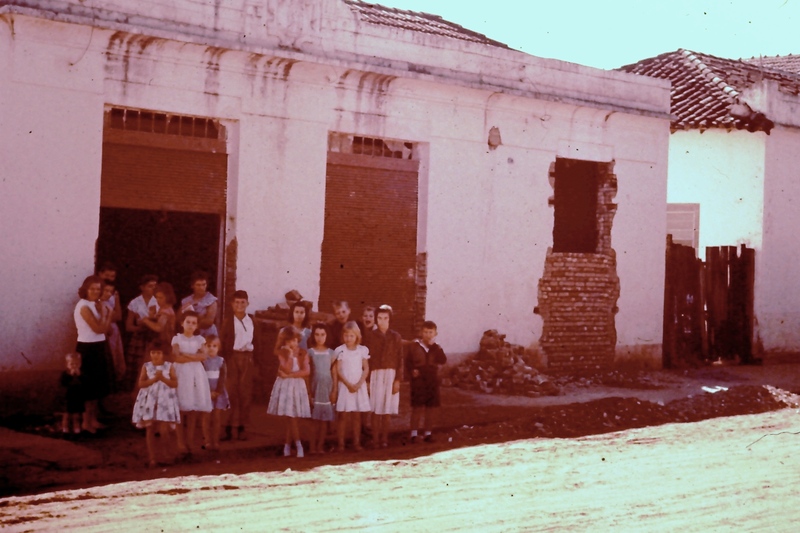 The hall being remodelled for services were where we first met Marlene and family. Her family was just one of the miracles that came through that simple hall. We did just that that. We opened our arms to Marlene and it was one of the best decisions we ever made. She was to help with chores in our home and was to get her schooling. We came to love her as one of our own, in fact people who did not know her thought she was our child for she was blond and fair. We treated her as our very own; she was about 13 when she came to us. I’m sorry the pictures we had of her have disappeared over the years. As missionaries Doris and I were often away in the evenings so it fell to Marlene to care for our children. Monica who was about 8 and Vernon almost 2 years younger. One night as we came home we noticed the lights going out and all was quiet when we came in the front door. Marlene and our children had been having a good time playing together, but we never objected to them not getting their sleep. Instead we appreciated how much they enjoyed each other. We were so glad to have Marlene for when we had lived in Rio, we had a bad experience with a maid that involved our children. Ouch! There is one job we gave to Marlene was to prepare the prawns for cooking. We bought those huge shrimp fresh at a local market but the cleaning gave Doris an allergic reaction. In any case we did like the veins taken out and then sliced into two for cooking. Yes, they were that big and Marlene made it possible for us to have the best seafood on our table. Brazilians love warm fresh-baked bread especially for their breakfasts–you may have seen those long slim loaves with the delicious crunchy crust. Yummy! So Marlene fit into this pattern by going early each day to a nearby bakery and bringing back warm bread. So the five of us sat around the kitchen table to “tomar of café.” The exact translation is to have a coffee but for us it was breakfast time. Afterwards Marlene, Monica and Vernon went down the same hill with Marlene going one direction to middle school and our children the other direction. I’ve written somewhere how Vernon hated that school because of his teacher, for she taught with a ruler in her hand. During our time in São Paulo, Monica took music lessons and since Marlene had a talent for music, Monica passed on those lessons. Many years later when Marlene was attending a large Baptist church, she took part in the ministries of the congregation, and It was great for us to discover she became one of the church organists! Wow. After we left for furlough—or as they call it now, “home assignment” Marlene was able to continue on with her education till she ended up with her teaching certificate. Even when those years were hard, she has done so well. Time goes by with changes, one of which for her was open heart surgery. Another that is much more pleasant, is to see her children grow up so that now she with her husband can enjoy their grandchildren. 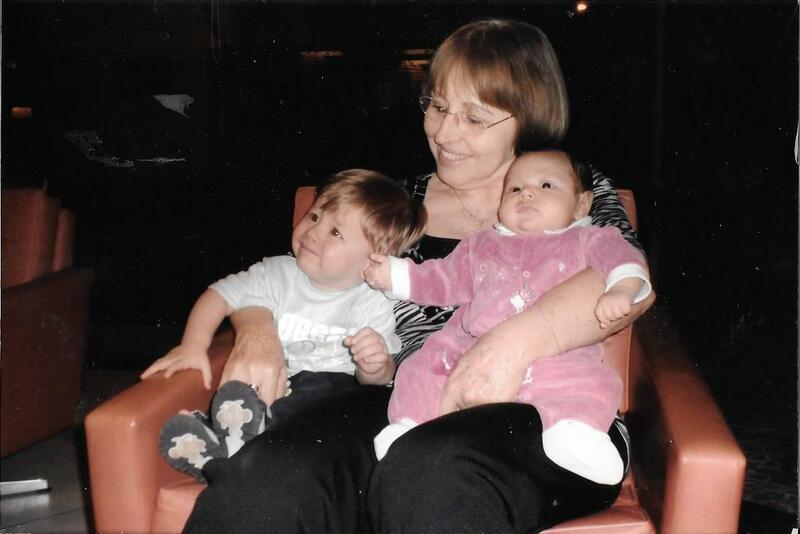 Marlene writes, “These are my beautiful grandchildren. César Augusto is one year and half and Fernanda is just six months old. I send these remembrances with all of my heart.” That picture is from 2010 so without doubt much has changed. 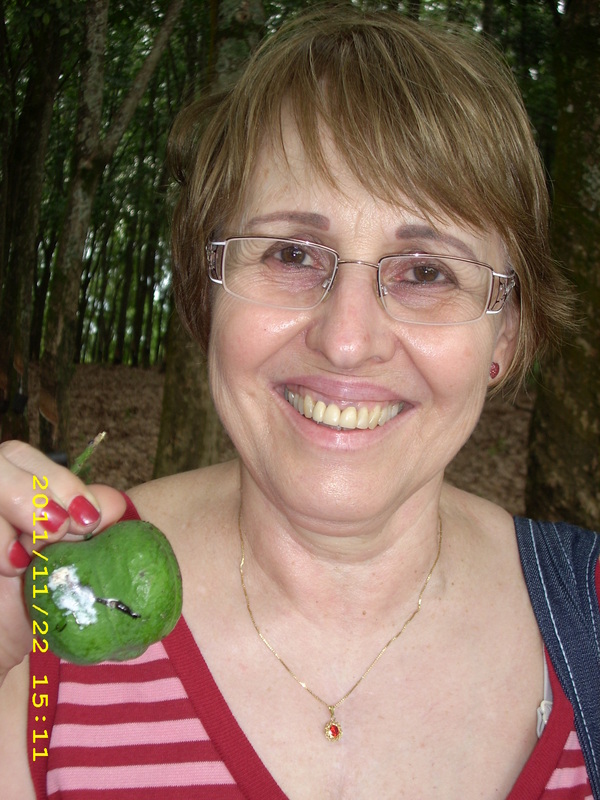 The time Marlene was with us was not that long but so many “saudades,” nostalgia still remains with us. Beyond that Doris and I thank God that the little we did for Marlene has blossomed into a wide ministry. Such small seed was sown and yet it continues to bring wonderful fruit for the Kingdom of Jesus. This entry was posted in Uncategorized on May 8, 2018 by rkenny2014. Snakes alive! The cardboard box of poisonous snakes was carefully held and tipped enough so the contents slipped over the edge of a low wall into the ditch. The snakes had been shipped in from an area of the Amazon basin and though the snakes were quite lethargic after a long trip yet no doubt they were dangerous. This all happened at Butantan, the world famous snake farm and the ditch where the snakes were put surrounded a protective shelter. Those snakes were part of the research branch of Butantan and where specialized anti-venom medication is shipped around the world. Oh my, more yet! Add on to the snakes, poisonous frogs and spiders. With the research that began in 1901, Butantan has worked to eliminate a large number of tropical diseases and now continues its wide-ranging work. 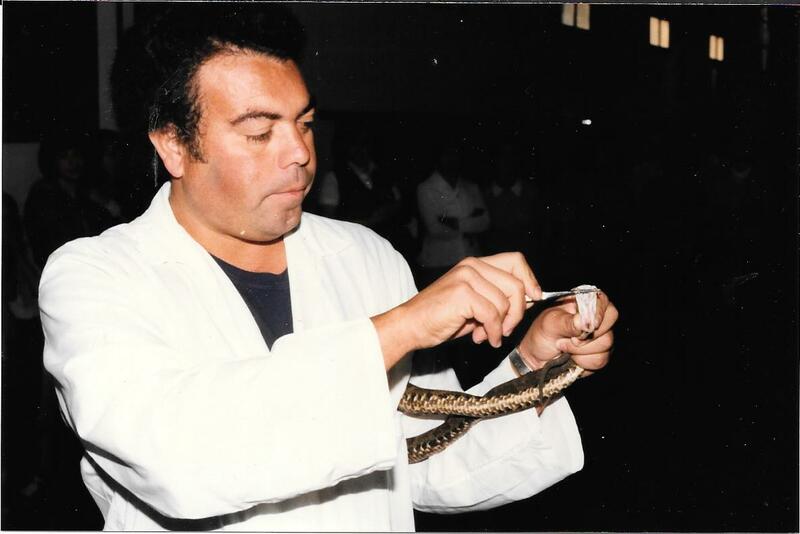 In this photo a worker shows us how to extract venom from a snake. Our family were at the Institute with Jim and Florence Mannoia doing a bit of a touristy thing. But when those snakes came slithering out of the box, Florence gasped and turned away. Jim took her hand and directed her to another area–she might have fainted because of her snake phobia. I’ve few pictures of the Mannoias but here is one with Doris, Florence and some of our families. The remote beach where our families spent an overnight was so isolated that we thought it gave us total protection. 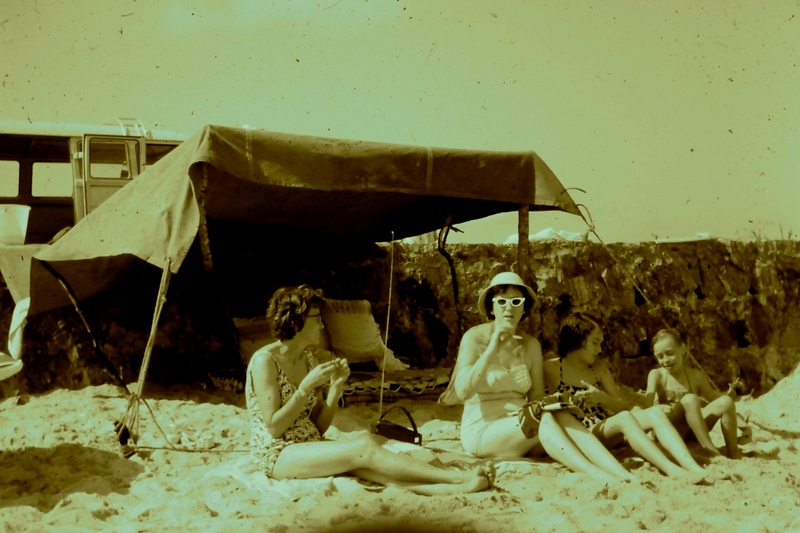 That night we guys slept not far from the van on the sandy beach while the ladies and children curled up in the van. But all our pots, pans and dishes were stored under the van—and they all walked off. No snakes but in any case, we were safe. I mention that, for so often I had read in Brazil of thieves killing any possible witnesses before they steal something. So where have those snake made their homes? They are most common in the river basins and swamps that are plentiful across Brazil. But they do appear in small areas of grasses and trees—I’ve written a blog about snake, in days past, at our seminary. 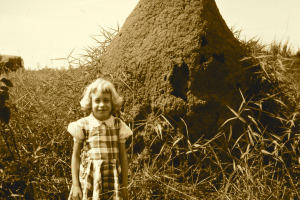 This picture with Monica and an ant mill might have had snakes close by. 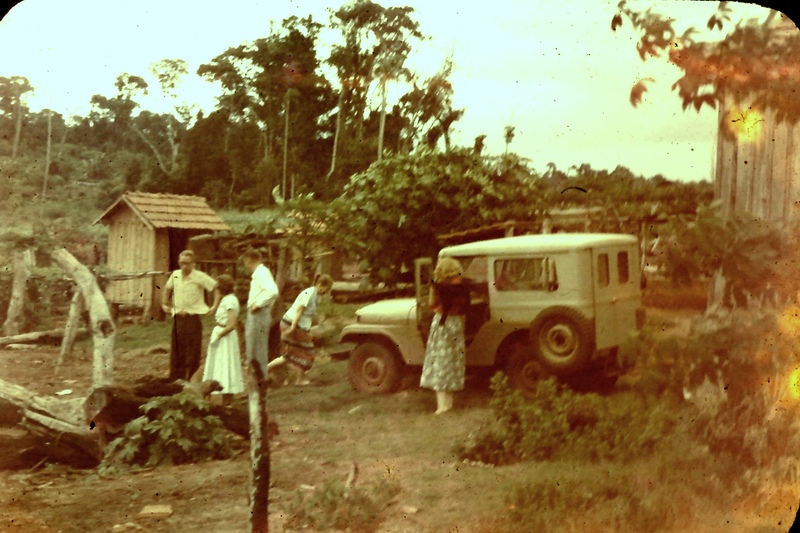 I am sure there were snakes in the area of Paraná State where our missionary friends, the Kaspersons, worked. Snakes never bothered them mostly because they never bothered the snakes. But when it comes to the snake or serpent to which Satan is compared, he will pester us with temptations till our lives become painful and warped. He bothers us no matter what. (Genesis 3:1) But everyone desiring deliverance can find it in Jesus. John the apostle says, “…as Moses lifted up a serpent in the wilderness, (numbers 21:8) even so must the Son of Man be lifted up, that whosoever believeth in him should not perish, but have everlasting life.” That is the end of the story about snakes and the snake. Victory is in sight through Jesus. This entry was posted in Uncategorized on May 1, 2018 by rkenny2014.